Bengaluru Football Club have named their 25-man squad for the 2018-19 edition of the Indian Super League which kicks off in little under two weeks, the club announced on Tuesday. Having selected a new-look squad from the player-draft after making the move to the ISL last year, the Blues, who finished top of the league with a record tally of 40 points, have retained as many as twelve players this season while five youngsters make the move up from Bengaluru FC B. Head coach Carles Cuadrat who took charge of the side in the AFC Cup Inter-Zone semifinal last month, has been working hard with the boys and expects a tough season when the league kicks off in two weeks. “Our season began much before most clubs given we had our AFC Cup commitments. This has given us time to work with the squad we have. We have managed to retain a fair number of players from last season which is always a good thing. This season will also see five players from Bengaluru FC B fight for a place on the team and that is always encouraging as a club. There’s a good mix of experience and youth and every one of the players is hungry. It’s going to be a tough season, but one that we will give everything we have,” said the Spaniard. While Sunil Chhetri will continue to lead the squad in his sixth season as a Blue, goalkeeper Gurpreet Singh Sandhu, defenders Rahul Bheke and Harmanjot Khabra along with attackers Boithang Haokip, Thongkhosiem Haokip and Udanta Singh are the Indian players to be retained. Midfielder Kean Lewis and defender Sairuat Kima are the new domestic players signed earlier this season while, defenders Rino Anto and Gursimrat Singh Gill and goalkeeper Soram Poirei return to Bengaluru. Among the foreigners, Miku, who netted 20 goals last season will lead the forward line alongside Chhetri and joining him are Dimas Delgado, Juanan Gonzalez and Erik Paartalu. 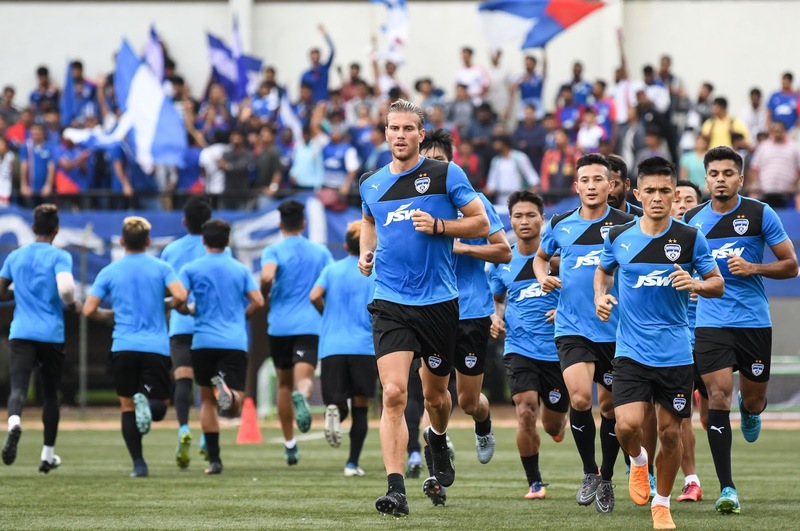 With the teams now allowed to sign only seven foreigners, as compared to eight last season, the Blues have brought in Xisco Hernandez, who made his debut last month in the AFC Cup, as well as attacker Chencho Gyeltshen and new signing Albert Serran. The five BFC B boys making the move up to the first team include Bidyananda Singh and Asheer Akhtar, who have made their BFC debut in the AFC Cup, along with Altamash Sayed, Aditya Patra and Ajay Chhetri. While all five impressed for BFC B in the 2nd Division League last year, Ajay was even part of U18 team last season and helped the team all the way to the final phase of the Youth League in Shillong. The Blues begin their Indian Super League campaign against defending champions Chennaiyin FC at the Fortress on September 30.